The conference will start at 9:00am on Wednesday and finish by 5pm on Thursday. The conference venue is a short walk from both Piccadilly and Oxford Road train stations. There will be a conference dinner on Wednesday at the conference venue. Please let us know any food allergies and dietary requirements you have as soon as possible by emailing Ruth.Maddocks@manchester.ac.uk . Once in Manchester, here are Things to do in Manchester in 2018! The final programme is now available. Please let us know as soon as possible if there are any issues. If you are having an oral presentation, please upload your slides (ppt or pdf) to this folder. Long presentations have 20 min slots (15 min presentations and 5 minutes for discussions). Short presentations have 10 min slots (including discussions) and can also bring a poster (please let us know if you intend to bring it). Posters should be up to the A1 format. They will be displayed throughout the two days, but are split in the slots where the presenters will be expected to be present in front of their poster. Please bring your poster directly in the poster room. Software demonstrations will be organised in the main conference room during the Posters and demos slots. The PhD forum is organised in the morning of the first day and everyone is more than welcome to attend. The forum will be followed by a “career” talk by Prof Wendy Chapman. Panels will be organised in the main conference room. The panel organisers should discuss any special arrangements with the conference office (contact@healtex.org). There will be a slot during the second day for open discussions, allowing pitches/announcements from the audience (up to 3 min each). Please contact the conference office during the conference if you want to present. The conference will take place at the Manchester Conference Centre (MCC) which is located in the Sackville Street area of The University of Manchester. It is within walking distance from the main train stations in central Manchester (Manchester Piccadilly: 6 min, 0.3 mi via Fairfield St/B6469 and Oxford Road: 6 min, 0.3 mi via Charles St). The venue is shown as building no. 11 on the interactive map. Directions are available from the MCC’s website. Delegates are asked to make their own arrangements for accommodation. We recommend booking accommodation early and any queries about accommodation before or after the conference should be directed at the hotel. For other queries feel free to e-mail the conference organizers. You can find hotel recommendations in the list shown below. This list is not exhaustive and there may be other accommodation options you may want to explore in Manchester. Most hotels in the list are within 5-20 min walking distance from the conference venue. Please note that the HealTAC-2018 organisers have arranged for special accommodation rates with some of the hotels in this list. 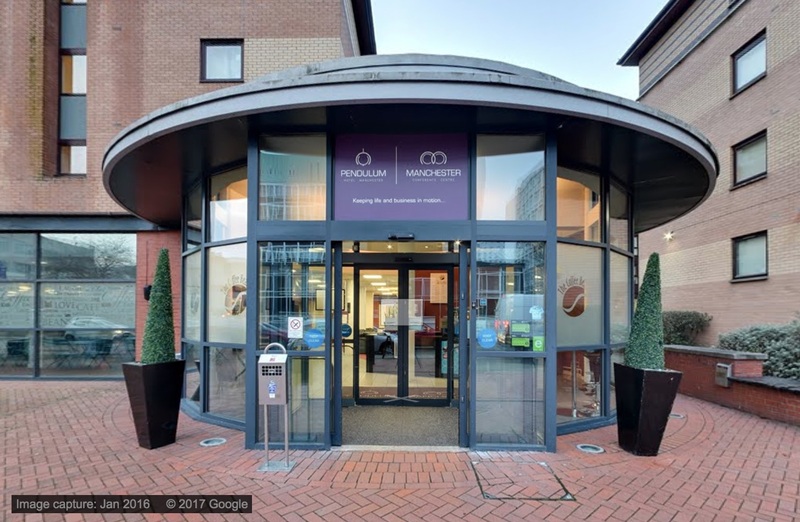 Holiday Inn Express, 2 Oxford Road, Manchester, M1 5QA – 6 min (0.3 mi) via Charles St.
Ibis, 96 Portland Street, Manchester, M1 4GX – 8 min (0.4 mi) via Sackville St.
5FJ – 13 min (0.6 mi) via Hulme St and Charles St.
Jurys Inn Manchester, 56 Great Bridgewater St, Manchester M1 5LE – 14 min (0.7 mi) via A5103, Oxford St/A34 and Charles St.
Travelodge, 227 Upper Brook Street, Manchester, M13 0HB – 20 min (1.0 mi) via A34. Chancellors Hotel, Chancellors Way, Fallowfield, Manchester, M14 ZT – (2.6 mi) 12 min car, 14 min cycling, 27 min bus, 51 min walking. Please refer to the University of Manchester’s maps and travel pages for details in how to get to Manchester and make your way around The University of Manchester and the Sackville Street area. In those pages, you can find specific details about how to get to Sackville Street if travelling by train, bus, tram or coach, car, or air. Please e-mail us at least 3-4 days in in advance if you require parking during ealTAC. The available car parks around the Sackville Street area are The Gatehouse and Charles Street (both being within 1-2 min walking distance from the the conference venue). For more information, please refer to the University’s car parking pages. We would like to wish you a pleasant and safe journey to HealTAC-2018! Meat option: Locally sourced breast of chicken roasted with thyme and garlic. Wild mushroom and red wine jus. Crushed new potatoes and seasonal vegetables.